Summary: Idaho doesn’t like their quarter. Can they appeal the decision? No. BOISE - Ever since the Idaho state quarter was unveiled, KBCI CBS 2 News has been hearing feedback from the public, some positive, but mostly negative. Some people are even wondering if it’s possible to reverse the decision. Some people in Boise having a negative reaction to Peregrine Falcon quarter said people talking at Rose Hill Coins and Jewelry Wednesday. “There’s a lot of things about Idaho that I think are exceptional and I didn’t realize the falcon was one of them. Would not have been my choice for the quarter, no,” said Dan Brady, coin collector and dealer. Dan Brady has been collecting coins for 47 years, since he was 7 years old. “So it was kind of a treasure hunt.” He says Idaho’s quarter doesn’t represent what our state is all about.“If you were going to take a handful of these quarters and take a trip across the United States and pass them out as souvenir of Idaho, I think people would look at them and go oh, so you guys have a lot of birds,” said Brady. And people we talked to in Boise had a similar opinion, that it doesn’t capture the natural beauty of the Gem State.“I’m not wild about it. They were saying they were hoping to capture Idaho, but I don’t think that really says it to me,” said Tom Watkins. “I mean I guess it’s all right. I think they could have found a better way to represent Idaho,” said Molly Howard.“I think it’s a pretty picture of a falcon but it seems to me that Idaho is about a lot more than this. I think there should be something else to it,” said Rick Borders. We did find a few people who liked the quarter.“It’s different. I had somebody say they didn’t like it and I said maybe we should boycott it, but now that I’ve seen it, I kinda like it myself,” said Chris Smith. Republican State Representative Jana Kemp collects the state quarters and is pleased with the look.“So when I saw it I thought it’s distinct, it stands out as different than what the other states look like. I think peregrines, potatoes, P is for potato… you know why not? Peregrine. Something totally different,” said Kemp. The United State’s mint narrowed down the selection to three choices, then former Governor Kempthorne made the final decision. People are wondering if they can start a petition to change the coin, but the Governor’s office says there is no appeals process. 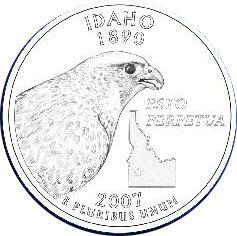 So like it or not, the peregrine falcon quarter will represent Idaho.